Arroz Chaufa, or Chinese-Peruvian Fried Rice is a wonderful example of how Peruvians embraced the ingredients and flavors of Chinese cuisine which was brought to Peru by Chinese immigrants over 150 years ago. Today, Arroz Chaufa can be found on the lunch menu of almost any restaurant in Lima, not just the popular Chifas. This dish has many variations but its two main spices are ginger and soy sauce. The recipe here is my own, and the key is to have all the ingredients prepared and measured ahead of time and set in a mise en place, so that you can quickly stir fry them and serve the dish immediately. Arroz Chaufa ingredients: ginger, egg, almonds, scallions, chicken, cilantro, pineapple, rice, salami. Perhaps because this was one of the first dishes my mom taught me to cook, it’s a comfort food for me and it always brings me great joy to make it. 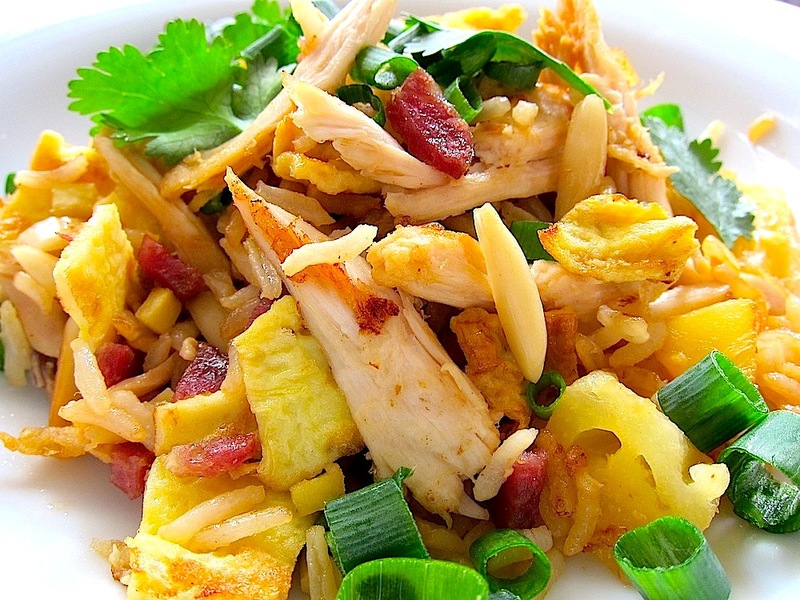 And though it’s relatively easy to prepare, with simple ingredients, the result is a complex combinations of flavors: the moistness of the rice, crunchiness of the almonds, sweetness of the pineapple, saltiness of the salami, sharpness of the ginger, softness of the egg, crispiness of the chicken — all in one bite. The best part is that I almost always have all the ingredients to make Arroz Chaufa in my fridge or pantry, ready to be prepared to provide some comfort. The Chinese New Year begins on February 10, 2013, and San Francisco is known for its Chinese New Year Parade, a tradition since the days of the Gold Rush and the Pisco Punch. Beat an egg and make a thin omelette using a small non-stick skillet. Transfer the cooked egg to a cutting surface and cut into small squares, set aside. Shred the cooked chicken, mince the ginger, chop the scallions, and separate the cilantro leaves from the stems. 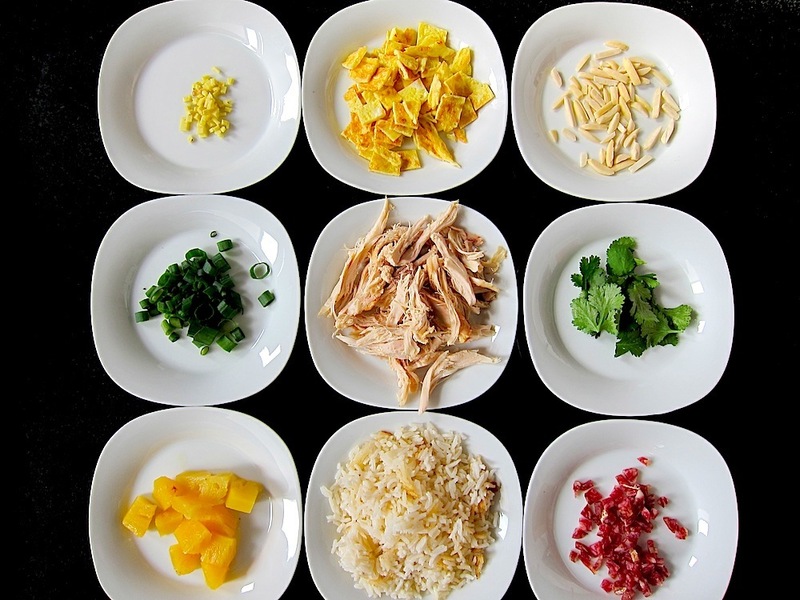 Set up your mise en place with all the ingredients, and have the stock, soy sauce, and pineapple juice measured and ready. Sauté the chicken, almonds, salami, and ginger in a skillet with canola oil over medium heat for a few minutes, until the chicken and almonds begin to brown. Add the chicken stock to the skillet, then stir in the rice. Add the egg and pineapple chunks, mix well. Add the soy sauce and pineapple juice, stir and remove from heat. Serve warm and garnish with scallions and cilantro. For simplicity, I like to use chicken that has already been cooked, such as rotisserie chicken from my local market. The chicken stock adds moisture and flavor, so don’t let it evaporate completely when stirring in the rice. Once the chicken and almonds are browned, the amount of stirring should be minimal, enough to mix the remaining ingredients.